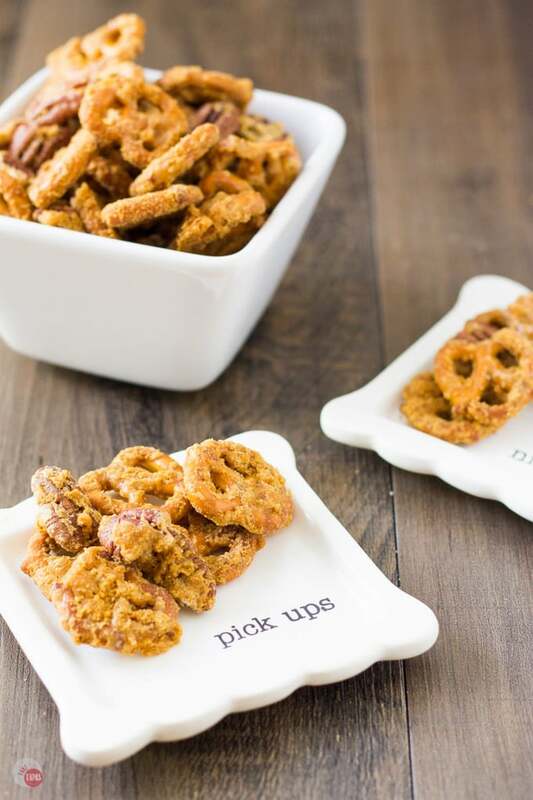 Step up your snack game with pretzels and pecans covered with a crispy caramel coating that is addicting! You will be asked back when you bring these crack pretzels as a hostess gift for sure! The holidays are here and that means crazy schedules and gift-giving. Like everyone, you are probably stressed to your maximum and can’t handle one more thing on your to-do list. Every year I want to plan ahead and have the perfect holiday season and then I wake up on December 15th and still have no tree, no gifts bought, no pounds lost, a room full of dirty laundry, and unwashed hair. Every Freaking Year! This year in my blogging journey, I have definitely made strides in my goal-setting and planning ahead. I actually had blog recipes planned a month in advance (even though I only had the recipe scribbled out on a sketch pad and a note on my editorial calendar that I want to post it-still progress) and started to feel a little extra breathing room! A lot of that also comes from not trying to do it all, taking a step back and prioritizing my time, and not getting sucked into all these unobtainable ideas of perfection that go with being a wife and mom. One way to do this is to do a little at a time. Having a few make-ahead Christmas treats in recipe box really helps too. 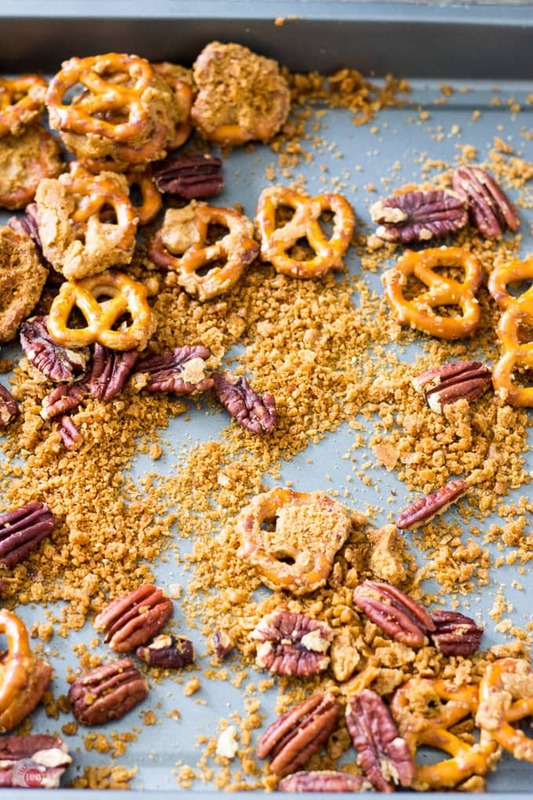 Just take me to the CRACK PRETZELS AND PECANS Recipe Already! 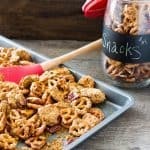 If you’d rather skip my (very helpful, I think) tips and tricks, essential cooking info, and similar recipe ideas – and get straight to this delicious easy PRETZEL CRACK AND PECANS recipe – simply scroll to the bottom of the page where you can find the printable recipe card. This is not saying that you can avoid unplanned emergencies and last minute projects since we are all susceptible, but I have found ways to say no and some other things that help me when I have to say yes. This year I have been really good at saying no to projects but when it comes to my kid’s teacher’s gifts I never say no! The next best thing is a unique edible gift that they can save for themselves or use as a gift for someone else. They get busy too and can’t go to a party empty-handed. 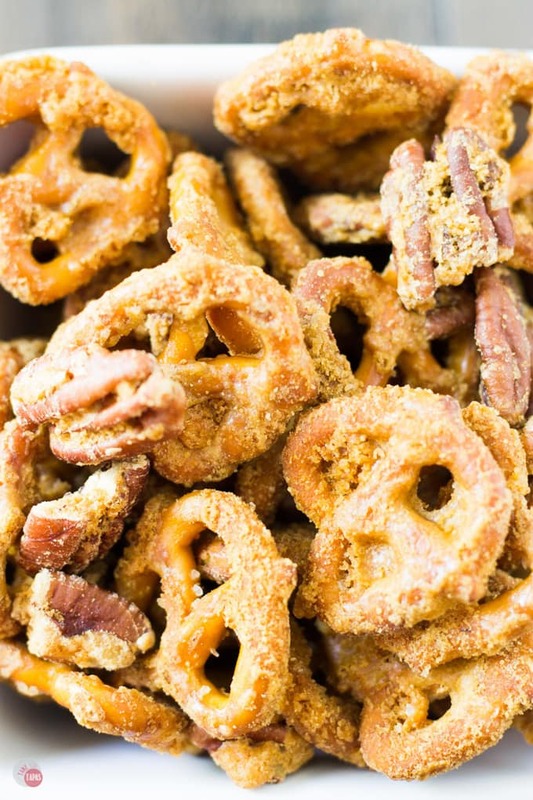 These Crack Pretzels with Pecans are the perfect gourmet food gift. Dress them up in a decorative mason jar and skip the wrapping paper. Crack Pretzels are a delicious inexpensive hostess gift! My go-to edible gift is Crack Pretzels. Last Christmas, I made a Crack Chex Mix that turned out to be a big hit! It’s the usual snack mix but with an addicting crispy caramel coating much like caramel corn. This year, inspired by my son’s addiction to pretzels, I switched up the snack mix part. Total win! I knew I wanted to make these Crack Pretzels for the teachers because as an easy Christmas baking recipe, it also makes a large amount so I could get away with making one batch. Even better win! You can make enough of them in one batch. I can make them a few days ahead of time and they will hold for up to a week with proper storage. Even if my son mentions that he needs teacher’s gifts by tomorrow, I can whip up these easy holiday dessert Crack Pretzels! 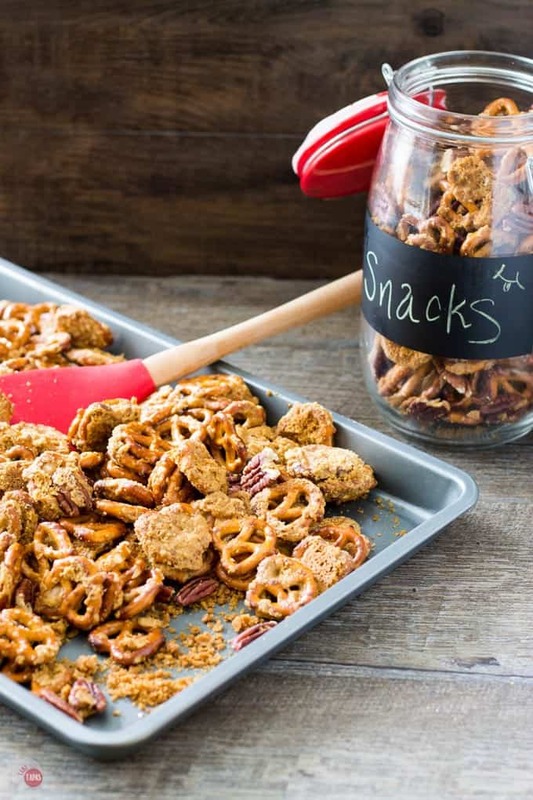 How do these Crack Pretzels look for a last minute teacher gift? The crispy caramel coating will blow their socks off! Try giving these in a fun chalkboard label mason jars! Q: Can I use a different nut other than pecans? A: Yes, but I am a sucker for pecans so I use them the most. Q: Can I use pretzel sticks instead of the twists? A: Sure! I don’t think you will get as much of the caramel coating sticking to them as the twists due to less surface area for it to cling to. Q: How long will the crack pretzels last? A: If they don’t get eaten, they will last about a week before they start to get soggy. Q: What do I do with the caramel coating that doesn’t stick to the pretzels and bakes on the pan? A: I scrape it off and use the crispy buttery crumbs for topping my ice cream, yogurt, or just licking off my fingers! Another great thing I love about these Crack Pretzels is it leaves you a little surprise you get at the bottom of the pan after baking them. The caramel coating sometimes chips off the pretzels when you stir it leaving little bits of crispy caramel sugar in the pan. After cooking, I gather up the pretzels and pecans and there is about a 1/2 cup of these wonderful little crunchies. All it takes is 15 minutes of prep and an hour in the oven while you are doing laundry or decorating the tree. After an hour you will have a large batch of edible heaven you can use for gifts or snacking while watching your favorite holiday movie. Whatever is on your to-do list this holiday season you have time to make a batch of these Crispy Caramel Crack Pretzels. That is definitely a holiday stress-reliever if I ever saw one. Other great Holiday Sweets to try! 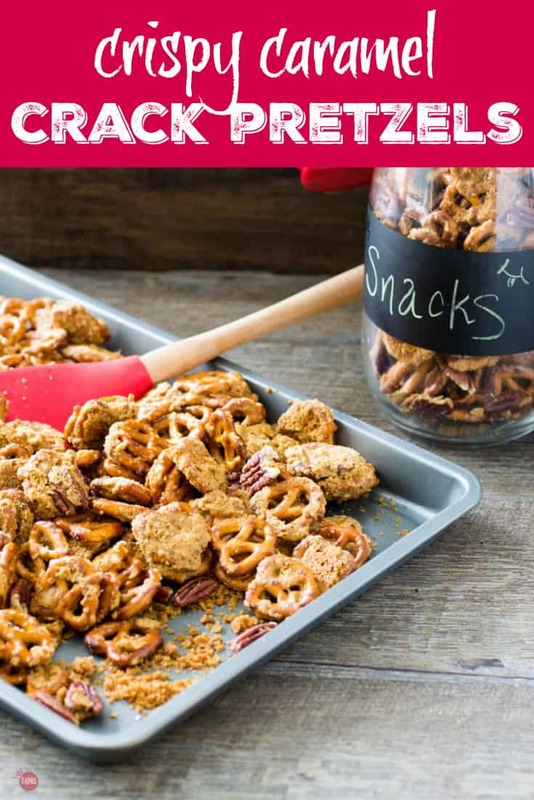 If you love this CRACK PRETZELS RECIPE as much as I do, please write a five-star review in the comment section below (or on Pinterest with the “tried it” button – you can now add pictures into reviews, too! ), and be sure to help me share on facebook! Mix the pretzels and the pecans in a large glass or metal bowl. Do not use plastic! In a medium saucepan, add the butter and sugar. Remove from burner and add the salt, vanilla, and baking soda. When you add the baking soda, it will foam up and bubble so be very careful. Stir to settle and mix. Pour over the pretzel and pecans and stir quickly. The sugar coating will start to harden fast. Once it is mixed, pour onto a jelly roll pan or baking sheet and spread out. Bake at 250F for 1 hour stirring every 15 minutes. Store in gift jars or other another air-tight container until ready to give away. Or eat yourself. A Sweet and Salty Win here. I love the idea of putting caramel on pretzels. Snacking goodness here. Oh those look fabulous!! I need to go get me some pretzels now. Thanks so much! I love the combination of sweet and salty! What a great snack! Thanks so much for sharing your awesome post with us at Full Plate Thursday. Wishing you a fantastic 2017! Your supermarket really looks the business – and those pretzels sound and look amazing! Thank you for bringing it along to Fiesta Friday! This looks like the perfect salty & sweet snack! You have been featured this week at Dishing It & Digging It. Thank you so much for sharing with us 🙂 Wishing you a wonderful 2017! Jen, it’s nice to see you at this week’s Fiesta Friday party! These look great – perfect treat when I am watching TV! 😀 Have a blessed 2017! Thanks so much! Hope you have a great new year too! That looks absolutely amazing! I love sweet and salty snacks like this… I’m addicted already and I haven’t even tried it yet! 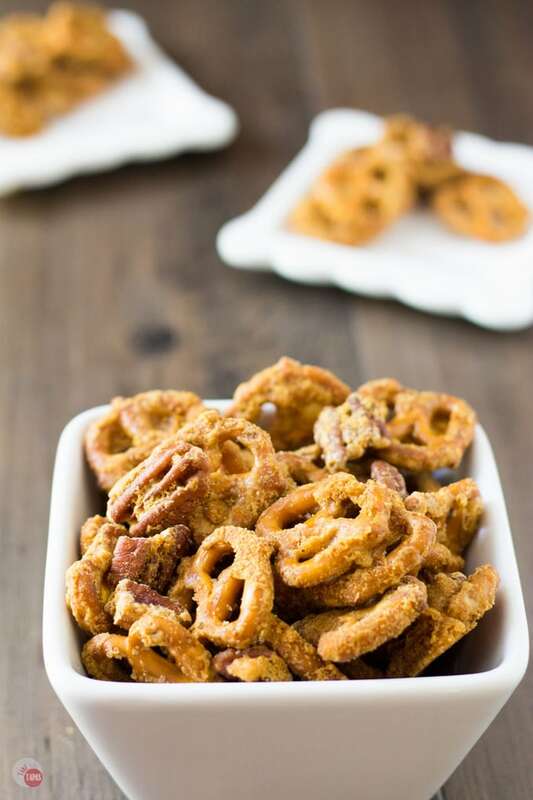 Your Crispy Caramel Crack Pretzels will be a perfect snack for the holidays! I really appreciate you sharing with us at Full Plate Thursday. Hope you have a great week and come back soon! Love the combo for this snack mix. Thanks for sharing at the Inspiration Spotlight party! Pinned & shared. Thanks for sharing them with us at Fiesta Friday! These sound good, sweet and salty. The combination is a new flavour for lots of people. I think this recipe is a real winner. Thank you for sharing it. Yummy! Thank you for sharing your recipe at the Snickerdoodle Create~Bake~Make link party! Now this looks tasty! Thanks for sharing on the What’s for Dinner link up! Yum! This is a great idea!